Ashley Smith was adopted when she was 5 days old, and according to her adoptive parents, Coralee Smith and Herbert Gober, had a normal childhood in Moncton, New Brunswick. 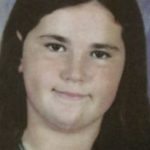 Between the ages of 13-14, her parents noted distinct behavioural changes in the child; by age 15 she had been before juvenile court 14 times for various minor offences such as throwing crab apples at a mailman, trespassing, and causing a disturbance. In March 2002, Smith was assessed by a psychologist who found no evidence of mental illness. However, her behavioural problems continued and she was suspended from school multiple times in the fall of 2002.